Today’s presentation by Lou Stanley was about the Booth Museum of Western Art located in Cartersville, Georgia, a town of 20,000 just north of Atlanta off I75. There are other museums in Cartersville including the Tellus Science Museum and the Etowah Archeological as well as preserved Indian mounds from about 1,000 years ago. The Booth Museum opened in 2003. 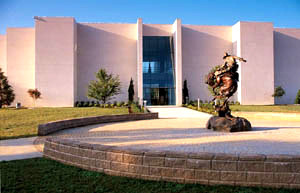 It is the only museum of its kind in the Southeast and the 2nd largest museum in Georgia. There were several statues on the exterior grounds as well as a large totem pole. Inside there were many galleries, each filled with related sculptures and paintings. 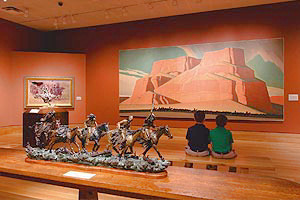 The Modern West gallery showcases changes in art style over the last 50 years including a flag painted horse, Teddy Roosevelt and his Rough Riders, and John Wayne as the Frontier Marshall. 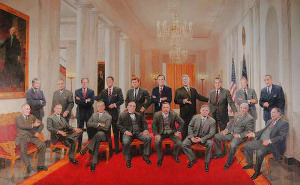 Other galleries include the Mythic West, Native Hands, Heading West, Cowboy Gallery, and the Presidential Gallery with signed letters from every US president as well as other memorabilia. Geronimo, paper sculptures, the Civil War and, of course, the American West were also given their own galleries. 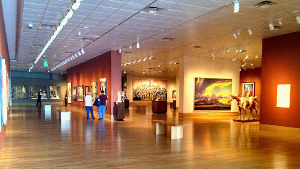 The Booth Museum is a unique facility that is well maintained, large, historically sensitive but accurate in its artistic details. Any person interested in this genre of art should find this facility most interesting. At 8:45 AM, the Scientech group gathered in light drizzle at the parking lot of Knights of Columbus Club and started on the drive to Benton County, after a nice cup of hot coffee and King’s donuts provided by Jim Bettner. The bus arrived at 10:55 at the office of Hoosier Wind Farm. We were met by our local guide, Mr. Harry Hoover, instructed about the changes to the morning agenda. Instead of a lecture, he decided to first take us to tour the wind farm fearing impending thunderstorms. We took our time and pictures of a giant blade from the wind farm painted with graffiti. He then took us on tour of the wind generators at Ear Park and parked the bus near the base of a giant generator. 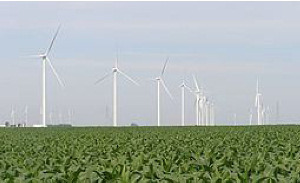 Earl Park is the earliest wind farm in Indiana, becoming operational in May, 2008. There are 87 GE turbines in Earl Farm. There are 495 turbines in Benton County, 87 made by GE in Earl Park, 40 Clippers and 188 Vestas at Fowler Wind Farm. There are 303 turbines in White County. The GE turbines generate 1.5 megawatts and have blades up to 150 feet long and 250 feet from base to cell. They generate electricity for 450 homes per year. The Clippers have blades of 188 feet long and generate energy to supply 750 homes. The electricity is delivered to different areas of the United States. Some is sold to Duke Energy and the Chicago area. During construction, the 20-foot base needed 35 trucks of concrete for support. The towers were constructed from 2 to 3 sections while the hub and blades were lifted up by a crane. Each tower cost about 1.3 million dollars and the company pays a lease of $7500 per turbine per year to the local farmer. The tour was followed by showing of slides and video by Mr. Hoover at the office. The group then boarded the bus for a trip to get lunch at Purdue University Faculty Club Lounge. The talk today was broadly classified as dealing with unmanned systems. Dr. Baker holds a BS in mathematics and an MS in Computer Science from ISU. 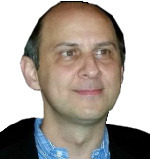 He earned his PhD in Information Systems from Nova South Eastern University. 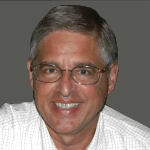 He has an extensive work history in industry and is cofounder of Xroads, a consulting firm dealing in unmanned systems. In 2003 he retired with the rank of colonel from the Indiana National Guard. 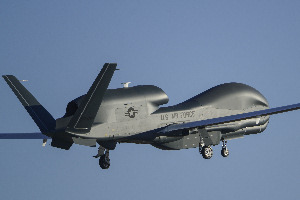 Unmanned systems are defined as devices or machines that are equipped with the necessary data processing units, sensing devices, automatic controls and communication systems, and are capable of performing missions without human intervention. 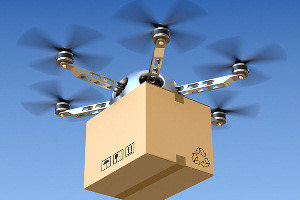 Dr. Baker initially pointed out the nearly infinite multiplicity of tasks that unmanned systems could perform. He then devoted more time to a detailed discussion of the tasks that are now or soon will be available using aircraft, from small to large and both heavier and lighter than air. He discussed the problems with maintenance of safety in our air space with an ever increasing amount of air traffic, especially after large companies begin to make deliveries of merchandise with small UAVs. 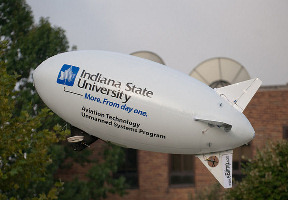 Dr. Baker closed by presenting a close-up view of some of the activities of the classes at ISU in the current program which provides a minor in unmanned systems. It seems there will be a huge demand for people trained in this field. Salim Najjar, B.S., Engineering, made a presentation about a 2010 Medical Mission to Uganda in which he participated. First, a short biography on our speaker follows. 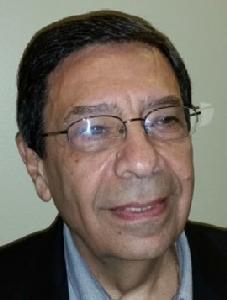 Salim, a native of Lebanon, traveled to the United States for college and graduated from Tri-State University, Angola, IN in 1962. After working as senior Project Engineer on the Saudi Arabian oil pipeline, Salim returned to the US and settled into a successful career at Fink, Roberts & Petrie, where he progressed in rank to become President of the firm in 1989. Uganda, a country of 35 million people in 2010, did not have a hospital with the capability to perform pediatric cardiac surgeries. Children were dying because of cardiac defects such as patent ductus arteriosus (PDA), in which a duct between the pulmonary artery and aorta fails to close following birth, resulting in heart failure and death by the age of 40-50. Rotary Clubs in the US and Uganda applied for and received a grant to address this issue by performing pediatric surgeries on 10 children while simultaneously training local doctors to perform the surgery after the team returned to the US. Dr. Mark Turrentine, pediatric surgeon, was the medical lead for the team of 11 MDs and RNs assembled in Central Indiana to travel to Uganda. Salim traveled with the team as documentarian and photographer (paying his own way). The team arrived at the Entebbe airport in Uganda on Sunday, 4/9/10, and then traveled to their hotel in Kampala. Not having the luxury to acclimate to “jet lag,” the team reported to Mulago Hospital ready to work on Monday morning. After reviewing the children’s echograms, the team initiated surgeries. The first patient, Esther, was 5 years old and was afflicted by PDA. The procedure involved opening her chest, maintaining blood flow with an “aged” perfusion machine, repairing the heart defect, followed by closing the surgical opening and allowing the patient to heal. The first procedure took 2.5 hours and went smoothly. The following 8 surgeries went well without issues, with the exception of one in which a power outage threatened to postpone completion. Fortunately the power returned in time to allow safe completion of the surgery. The tenth patient was unfortunately found to have HIV, and because the team was not able to safely handle this added complication, they quickly substituted two children less than one year old as candidates for surgery. At the end of the week the team had successfully completed the surgery program, saving the lives of 11 Ugandan children. Moreover, the training of local doctors was successful, because 4 years later, local doctors in Uganda have conducted over 100 successful surgeries. Early in the Civil War the Union forces devised a plan to choke the South’s economy by blocking their ports along the Atlantic and the Gulf coast. This was called the Anaconda plan enforced by their ‘blue water’ navy. The plan to defeat the South included controlling the Mississippi River and its four main southern tributaries, the Cumberland, the Tennessee, the Arkansas and the Red Rivers. The ‘brown water’ navy refers to those ships that were built to fight on the rivers as opposed to the ships that patrolled the Atlantic and the Gulf as part of the ‘blue water’ navy. By January of 1862 the brown water navy had 7 gunboats ready. The first battle the Union won during the Civil War was when the ‘turtles’ helped take Ft. Henry on the Tennessee River. Later the Union captured Ft. Donelson on the Cumberland River. The ‘turtles’ were defeated here but General Grant took the fort by land. 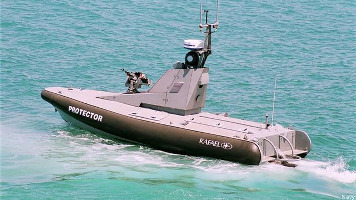 Other types of gunboats included 76 ‘tin clad’ boats that were fast and good in shallow water. There were 9 other boats specially built for ramming other boats. The fort at Memphis was minimally defended and easily taken. Capt. David Farragut captured the fort at New Orleans easily with his ‘blue water’ navy. The ironclad USS Cairo was sunk on the Yazoo River by the use of underwater bombs called torpedoes. 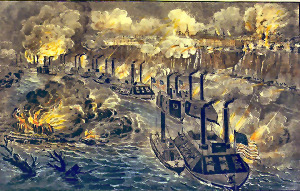 The last obstacle to the Union’s control of the Mississippi was Vicksburg, called the Gibraltar of the South. 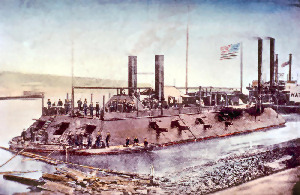 The Union navy was able to run past Vicksburg and ferried 40,000 ground troops across below the fort, eventually laying siege, culminating in victory on July 4, 1863. This was one day after the Union’s victory at Gettysburg. The final major battle on brown water was the Red River campaign. Joseph Bailey built dams to raise the water level over rapids so the gunboats could escape thus saving the brown water navy. People born before 1936 in the U.S. were subject to many types of infection from the Streptoccus (Strep) bacteria. The year 1936 is chosen because in that year the antibiotic sulfanilamide (Sulfa) became available for use. It had been used in France and Germany for a few years before that. Prior to that, going back centuries, there was no treatment for Strep. In 1084, people in Vienne, France were stricken by St. Anthony’s fire. No one knew what caused the red burning rash and/or pustules on the face and neck. Some people recovered, some died. It would appear in certain cities intermittently for centuries. Perhaps there was a religious cause for the Fire. Bones of St. Anthony were brought to Vienne by a knight after a crusade. People would pray to St. Anthony’s bones. The real cause was Strep. Scientists through the years began seeing organisms under the microscope. This led to Joseph Lister’s use of carbolic acid to clean wounds; to Louis Pasteur’s germ theory; and to Robert Koch’s postulates, with which he proved that the existence of microbes caused disease. In the U.S. until 1936, there were few effective medications and only one antibiotic. There was aspirin for fever and pain; morphine for pain; digoxin for heart failure; insulin for diabetes; quinine for malaria; Salvarsan for syphilis; and Plasmoquine and Atebrine for malaria. The new Sulfa was revolutionary. It was effective and relatively non-toxic. The first sulfa compound was patented in 1908, but it was soon out of patent. Both French and German scientists patented their version of sulfa. There was no U.S. patent, so American pharmaceutical companies made their own sulfa. The Bayer Co. did most of the research and marketing of sulfa. Sulfa cured childbed fever, then caused by Strep. Oliver Wendell Holmes in the U.S. and Ignatz Semmelweis in Vienna pioneered antiseptic procedures for the obstetrical suite. In Germany there were many word-of-mouth stories of dramatic cures. After a scientific meeting, Perrin Long and Eleanor Bliss, both of Johns Hopkins, brought Prontosil (sulfa) from Germany to the U.S. Soon more stories appeared of miraculous cures in America. FDR, Jr. was saved by sulfa in 1936. Sulfa was used to prevent meningitis and to treat wound infections. Sulfaguanidine was effective for dysentery due to Shigella. Sulfa was sold over the counter and subject to overuse. Resistance to Strep appeared in 1945 and to Gonorrhea in 1947. Then penicillin appeared and sulfa’s reign was over (or was it?) Later it was used for urinary tract infections (when paired with Trimethoprim), acne and Pneumocystis. Inspired by the sulfa miracle, scientists began developing new antibiotics: Tetracycline in 1945, Streptomycin in 1947, Chloroamphenical and Neomycin in 1949, Erythromycin in 1952 and Vancomycin in 1953. The discovery of sulfa led to the miracle of modern medicine. Revolutionary treatment in heart and vascular disease appeared in the 1940s and 1950s. DNA was discovered in 1953 and the human genome sequenced in 2000. Kidney dialysis began in 1960 – people had their kidney function replaced by a machine! Later kidney transplantation was performed, leading to other organ system transplants: heart, lung and pancreas. This talk brought into sharper focus a number of important but perplexing aspects of developing medical theory and practice by considering them from a historical perspective. Questions about the nature and boundaries of medicine invited much controversy in Hippocrates’ time – and they are still a matter of intense controversy. .. What is the physician’s ‘moral center’? (Alleviating pain? Prolonging life? 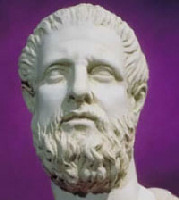 Hippocrates developed an oath (460BC – 370 BC) and provided a focus for perspective and values that have been very influential for the next two millennia. Professor Popa presented several examples of pre-Common Era medical related writings. His discussion of these items illustrated various ancient considerations that had been examined. However, even today, newer information development is required to bring about constantly improving understandings of the growing varieties of interacting knowledge-sets still needed for establishing a fuller comprehension of medical development needs. 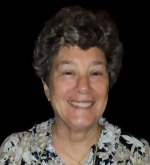 Dr Pilachowski is originally from California and earned her PhD in Astronomy at the University of Hawaii. She was Director of the Kitts Peak National Observatory in AZ. She has been at IU for 13 years and holds the Daniel Kirkwood Chair in Astronomy, Indiana University Bloomington. She is Past President of the American Astronomical Society. Dr. Pilachowski spoke to Scientech on Oct 7, 2013 on the WIYN 3.5 meter telescope at Kitts Peak. At that time, future funding was in jeopardy. She happily reported that NASA has covered that shortfall. Telescopes have naturally grown in size (diameter) as technology has advanced. The Great Paris Exhibition Telescope of 1900 was about 1 meter in diameter. The Hubble Telescope is about 2 meters in diameter but has the huge advantage on being outside the Earth’s atmosphere. There are many 8-10 meter telescopes which were built between 1993 and 2010, including the pair of Keck Telescopes on Mauna Kea. 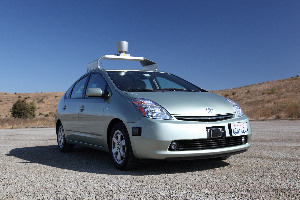 Collectively, they have made great advancements in the ability to observe the universe. - How was the Universe put together? - What is the Universe made of? - Is there life elsewhere? Observations of cosmic background radiation tell the nature of the universe starting 400,000 years after the Big Bang. With current understanding, the universe was “opaque” (did not emit electromagnetic energy) before that due to freely roaming electrons. As the universe continued to expand from the Big Bang, the density and temperature reduced so hydrogen atoms could form and light could escape and be observed. Galaxies and solar systems did not form until 200 million years after the Big Bang. The hope is that, with even bigger telescopes, observations with much better resolution will be possible back to the opaque universe (from the present back until 400,000 years after the Big Bang). 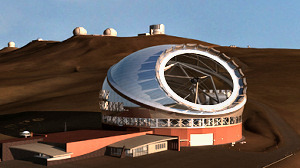 The proposal for a 30-meter-diameter telescope originated in the mid 90’s. The Hubble’s 2-meter telescope was launched in the same timeframe, but it is prohibitively expensive to build a larger telescope in space. On earth the atmosphere distorts the microwave radiation so that resolution is limited. Increasing the diameter would be ineffective on its own. A new key idea was Adaptive Optics which could allow an earth-based telescope to compensate for the blurring effects of the earth’s atmosphere. Sensitivity increases by the square of the diameter of the lens. Adaptive Optics offers the possibility for the sensitivity to increase by the fourth power of the lens diameter - a huge improvement. Hence the motivation to build a larger earth-based telescope. Not only would this allow observation of more distant (older) solar systems. It would also help in observing exoplanets which appear as small and dim. More than 1000 planets have been detected. Is there life elsewhere? Why 30 meters (approximately the length of a basketball court)? - Hit the “sweet spot” for Adaptive Optics. The twin 10-meter Keck telescopes at Kitt Peak have 36 hexagonal mirror segments; the 30-meter telescope (TMT) will use the same approach, but will have 492 segments. The TMT mirrors will be adjustable (Adaptive Optics) to compensate for the distortion caused by Earth’s atmosphere. The telescope will be able to slew to a new observation point in 5 minutes and the instrumentation will be ready in 10 minutes. The unique enclosure, designed by Canada, will allow observation of any point 25 degrees above the horizon in the south to the horizon in the north. A partnership has been developed with US Partners (Cal Tech, University of California, and the Gordon and Betty Moore Foundation) and international partners Canada, China, India, and Japan. Other partners are being sought. The notable absentee is the USA. Hopefully, the NSF (National Science Foundation) will find the wherewithal to become a significant partner. To date 30-40% of the needed $1.2 billion funding is unsupported. However, the project has started with site approval in Hawaii on Mauna Kea at 14,000 ft. Site prep started on time this year as well. If all goes as planned and full funding is acquired, early science operations are expected in 2024. Thanks to Dr. Pilachowski for a very interesting presentation. Today program was given by Dr. Gordon Mendenhall from the “A Bridge to Kenya, Inc". 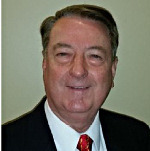 Dr. Mendenhall is a native Hoosier with a BA from Taylor University, and MS and a doctor of science from Ball State. He spent 31 years in the Lawrence Township School System. During this time he received the Presidential Award for Excellence in Science Teaching, and the Indiana Biology Teacher Award in 1989. 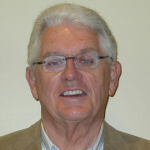 Upon retirement he joined the University of Indianapolis where he retired in 2011 as a Professor Emeritus. For the past several years he decided to take his knowledge of science in doing charitable work in a variety of places including Haiti, Kenya, Congo, Malawi and Honduras. Today he brought along a volunteer worker from Africa, Sister Stella from Kenya. Dr. Mendenhall and Sister Stella have just returned from their most recent visit to Kibera one of the largest and poorest slums in East Africa. Kibera has a million residents living in an area of just one square mile. Over the past few years Dr. Mendenhall has been active in the building of the Ushirida Children Center started in 2005. Both Sister Stella and Dr. Mendenhall shared many pictures of the village and the people they have served over the past years. During his visits he found that the people of Kibera had no vision care whatsoever. Dr. Mendenhall using “ A Bridge to Kenya, Inc." has developed a program that provides vision screening, and access to new or used eye glasses. Dr. Mendenhall provided the members the chance to see a new product which is a pair of glasses that the focal length of each lens can be changed by adjustments on each side of the lens. These glasses are made for either near or far sighted individuals. These amazing glasses can be purchased for just over $6.00 from the Netherlands, including shipping. Dr. Mendenhall feels strongly that the purpose of his work is not to come on a regular basis to provide screening, but to train the local people to do the screening, and then provide the necessary glasses needed. He told a number of stories about the wonderful feeling he had being able to provide both children and adults the ability to see properly for the first time in their lives. 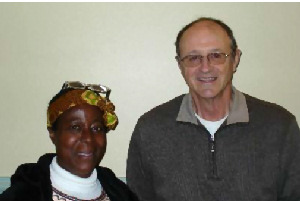 Both Dr. Mendenhall and Sister Stella strongly believe that education is the only way to empower the population in these developing countries. At the end of the meeting Sister Stella and Dr. Mendenhall, using a African drum, led the members in a native song of the power of one. For more information about the work of “A Bridge to Kenya, Inc.", please contact Gordon Mendenhall, 6465 Harrison Ridge Blvd., Indianapolis, IN 46236. Deductible donations may be made by check to "A Bridge to Kenya, Inc.", c/o Gordon Mendenhall at the address above. According to a 2010 report from the American Medical Association, about 20% of US adolescents (6.5 million teens) will have some form of hearing loss by the time they graduate from high school. It is suspected that most of this loss is derived from noise. The Broad Ripple Sertoma Club (meets on Wednesdays at the Knights of Columbus on 71 St.) has one of its missions the education of young folks in the hearing dangers of loud noise. Damaging noise is any loud sound from a rock band, iPad, lawn mower, chain saw, jet engine, etc. The club’s objective is to motivate young (4th to 6th grade) children into the habit of wearing earplugs when they are around loud noise. This presentation is made up of two parts, a Power Point introduction and conclusion section and an excellent 14-minute video that effectively explains how hearing works and how hearing damage occurs, while at the same time acknowledging the strong drive in teenagers and young adults to experience loud sounds at concerts, or listening to iPods, etc.). The video strongly encourages the use of earplugs to reduce the noise level by 25 to 30 decibels, depending on the design of the earplug. The essential point of hearing protection focuses on protecting the mechanism of the inner ear. The ear receives the noise (amplified 22 times) and presents it to the cochlea, which is made up of 30,000 hair cells. These hair cells are the vulnerable part of our hearing system. Loud noises will destroy these very small hairs and they do not regenerate. As the ear picks more and louder noises, (over 100 decibels) the hair cells die never to be replaced and the person’s hearing begins to degrade. Jim is a longtime member of the Scientech Club as well as a past club president. Pre-retirement he was an excellent cardiologist. He now spends his time on various projects including medical history, and, along with his wife, has become an excellent genealogist. In fact, Jim stated that he and his wife would be willing to teach genealogy to up to 10 individuals who were interested in doing genealogy and who were willing to donate at least $100 each to the Scientech Club Foundation. Jim’s talk began with the discussion of stated causes of death in the 18th and 19th centuries. These were accidents, decaying vegetation in swamps (miasma), epidemics, poor sanitation, insects and vermin and medical ignorance. Miasma included infectious diseases, many of which were and are carried by insects with and without animal reservoirs. These include Dengue fever (mosquito vector), Malaria (mosquito vector), Yellow Fever (mosquito vector), Typhus (louse vector), and Typhoid Fever (contaminated water supplies). Key improvements have been in the public health arena and include water filtration in 1882, septic tank introduction in US in 1885, and water chlorination and treatment in 1908. In 1928, sulfa & penicillin were introduced and have had a major impact on infectious diseases. The names of many of these diseases have varied over time and with various places. For example, yellow fever has been called American plague, bronze John, Dock fever or yellow Jack. Typhoid Fever has been called billious fever, enteric fever and swamp fever. Typhoid fever may have been the cause of the Jamestown collapse. Typhus may have been the final cause of death for many of the victims of Irish potato famine. Influenza, formerly called “grippe,” has killed millions over the years, as has the plague with the flea vector and the rat reservoir. Tuberculosis has been a big killer and has been known as consumption, lung fever, King’s evil, lung sickness, Potts disease (spine infection) and scrofula (lymph nodes of the neck). The talk then turned to tracking down the diseases that killed your relatives, and how to do that with death certificates, census records, tombstones, obituaries etc. Thanks to Jim for this most interesting talk.